The "traveling roadshow" bus had almost 200 people walk through it within the first three hours of being on display on Saturday. A block-long display promoting alternative transportation modes within the city and beyond wrapped up the Great Green Transportation Challenge event on Saturday, Oct.1. 2nd Avenue was lined with booths from St. Paul to Seymour Streets presenting transportation options for people of all financial positions. The bus was decorated with information about the city’s plans for the next 25 years of public transportation, and there was an opportunity for people to take sticky notes and write down their own ideas about what they believe would improve the city’s transportation system. Another board invited people to comment on what they thought of the plans that have already been made. Gene Kozowy, a transit operator and trainer in Kamloops, greeted me with a smile as I boarded the renovated bus. He spoke about how the most frequent requests transit receives are for increased service, especially at night. Kozowy talked about how extending the service by at least an hour on routes could make the difference between people being able to consider using the transit system to get to places like the wildlife park, for example, where the last bus leaves just after 5 p.m.
Public transportation wasn’t the only option being presented at the event. A series of hybrid vehicles, electric scooters and the Segway — an upright scooter that you stand to use — were also on display. A group of students from UBC were showing off a solar-powered car they have under development as well. Many of these alternative modes of transportation have their issues. Some of the hybrid vehicles came with a $30,000 price tag. The Segway is not legal to operate on the sidewalk, and the scooters have questionable uphill capabilities. The point of the event was not to sell products, though. 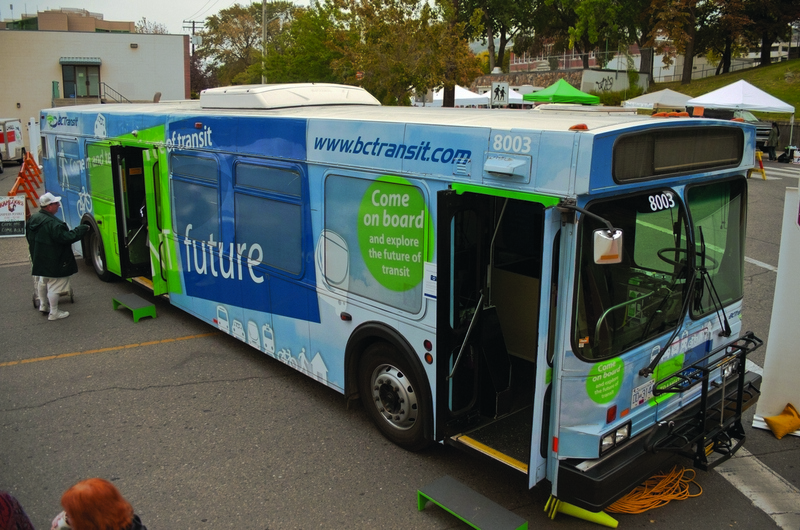 It was to get people to think about more sustainable methods of transportation, in the hopes of reducing traffic and promoting a cleaner Kamloops for the future.